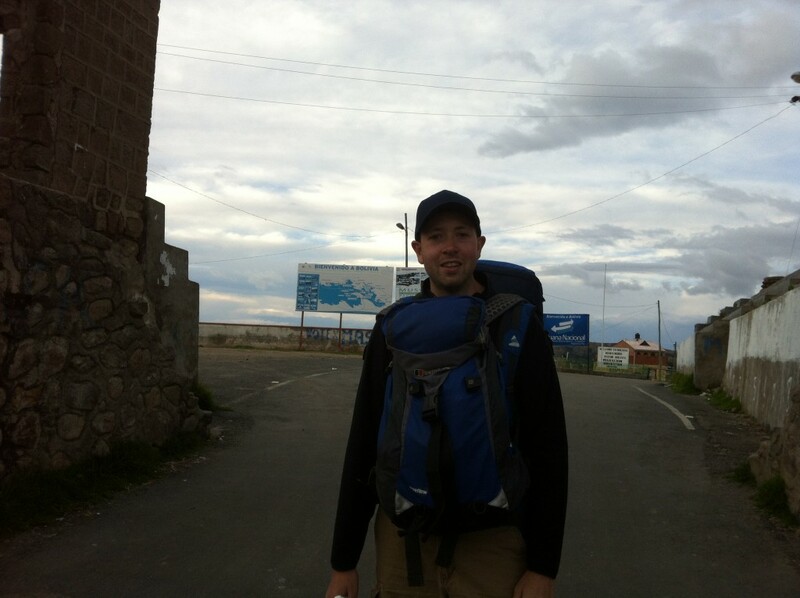 The goal was to get from Arequipa in Peru to Copacabana in Bolivia in one day – a distance of about 450km. It took two taxis, a long distance bus, two packed mini vans full of locals, a bicycle with a rickshaw-esque seat bench which could hardly move, and a walk over the usual no man’s land border crossing. 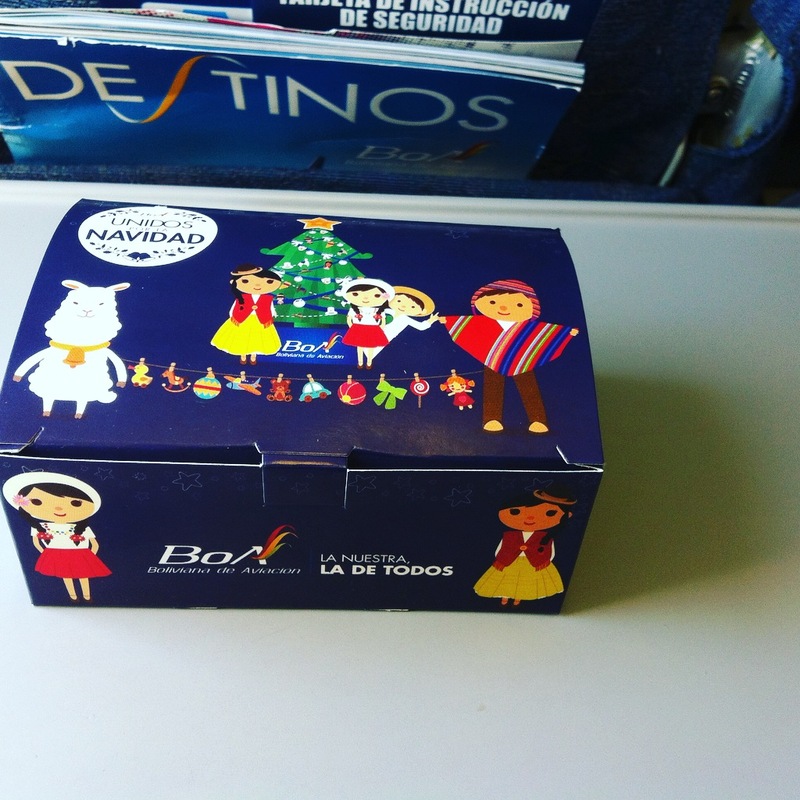 It was just after Christmas (2015!). St. Stephen’s Day to be exact. 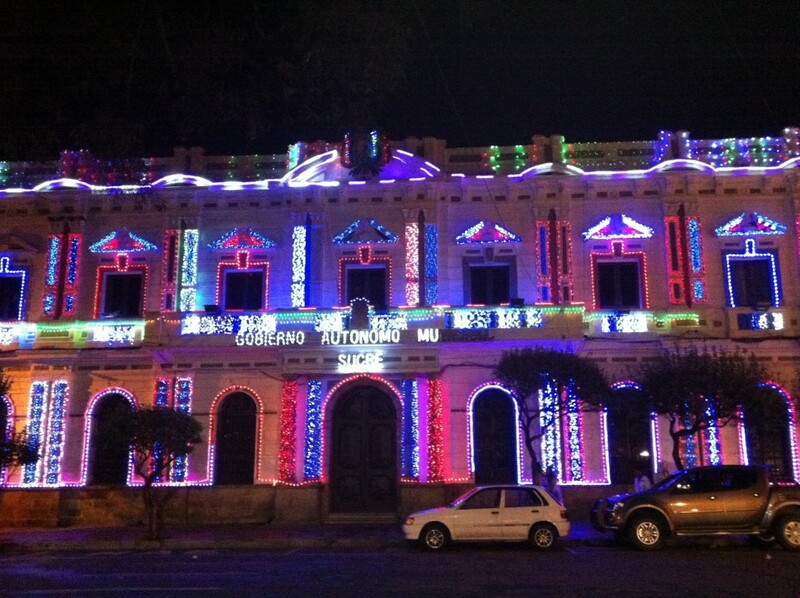 Christmas was well over in Peru by the 26th as their big celebrations are on the night of the 24th (see John’s previous blog post Here). With our heavy bags we got a taxi to Arequipa’s main bus terminal in time for our 9am departure to Puno with Cruz del Sur. 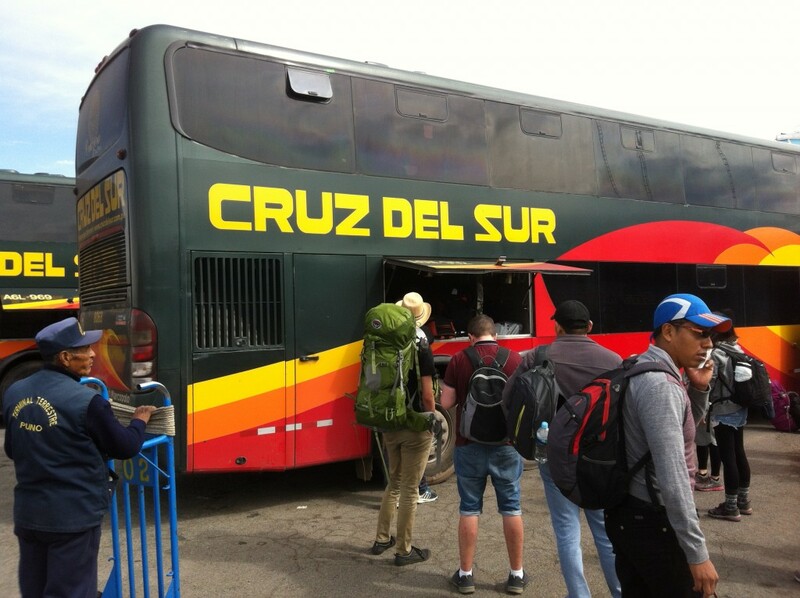 They are probably one of the best bus companies to travel with in Peru. 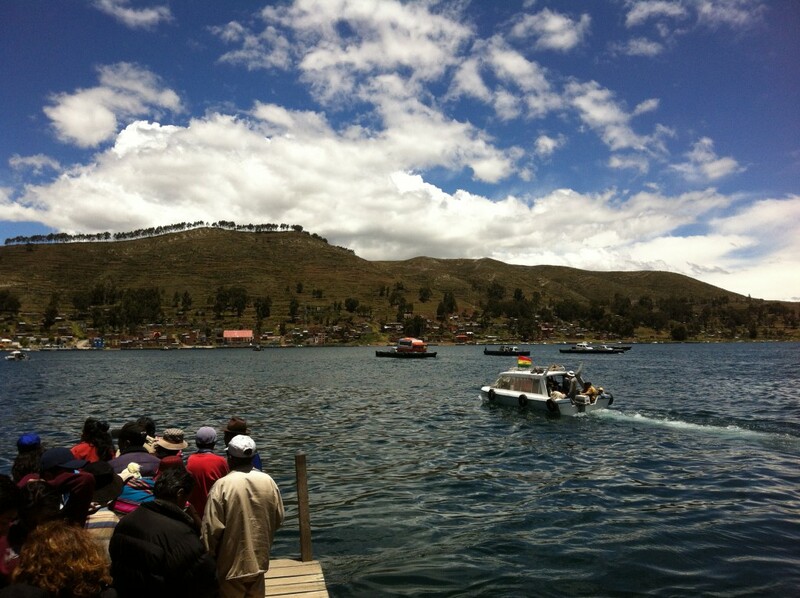 Lots of Americans and other non-backpacker types got on with us as Puno is the main base in Peru to visit Lake Titicaca. 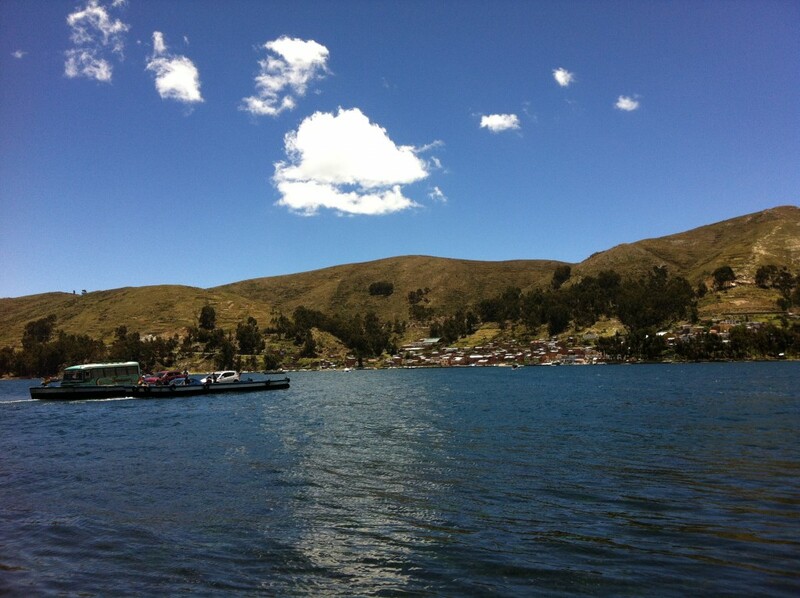 The journey was uneventful with lovely views out the window as the bus climbed and climbed up to Lake Titicaca (high altitude again which I’ll come back to) and skirted around its edge to Puno. We had considered staying there but all reports were that it wasn’t great as towns go. 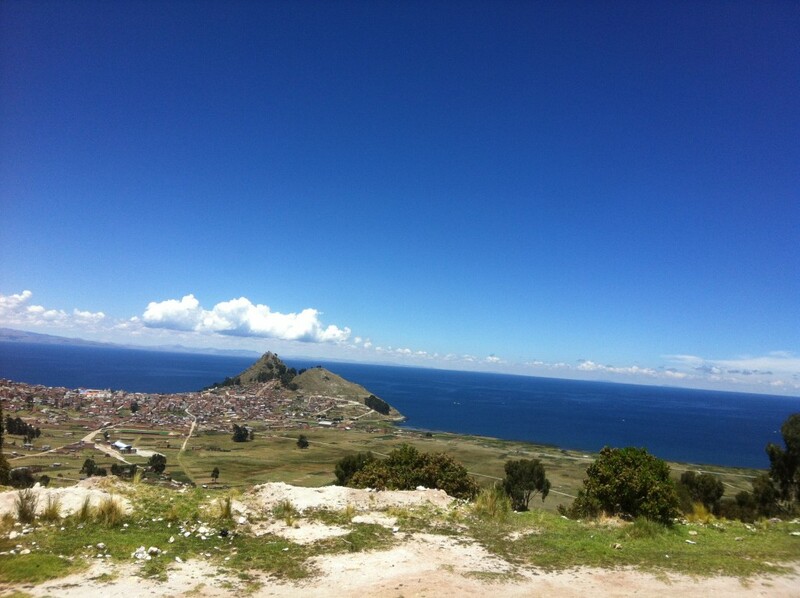 So we decided to keep going and visit Lake Titicaca from the Bolivian town of Copacabana. 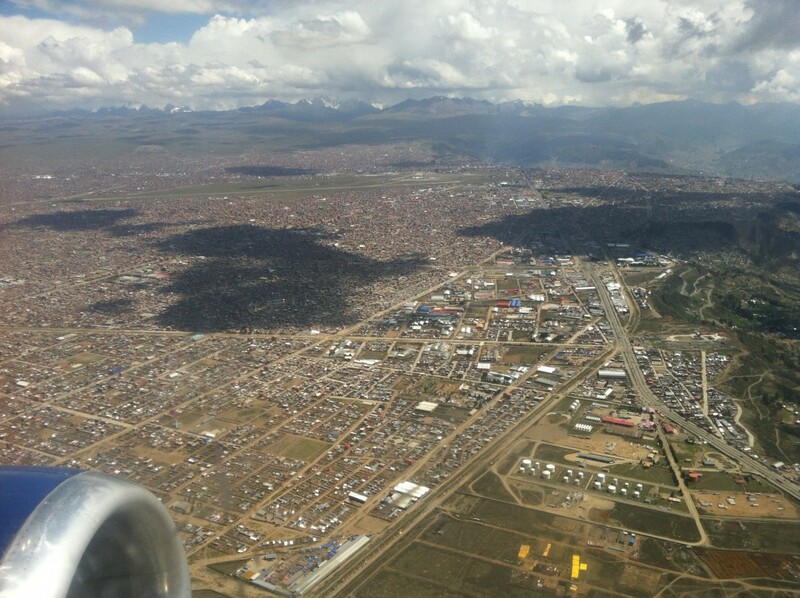 We arrived into Puno at about 3.30pm (after six plus hours from Arequipa). 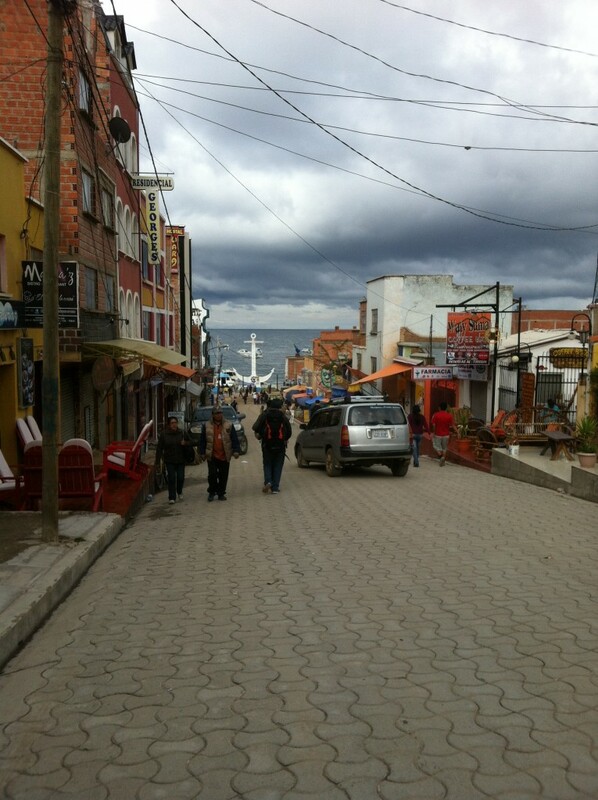 I had read that there were direct buses from Puno across the border to Copacabana but the last one left at 2.30pm. I still went asking all the ticket desks about buses that day and they were right.. we’d missed it. John had got our bags from the bus which took ages as they called out each bag tag number like it was an extended bingo game. So we walked about four blocks to a big open dirt yard with loads of white mini buses. All looking the same as each other. 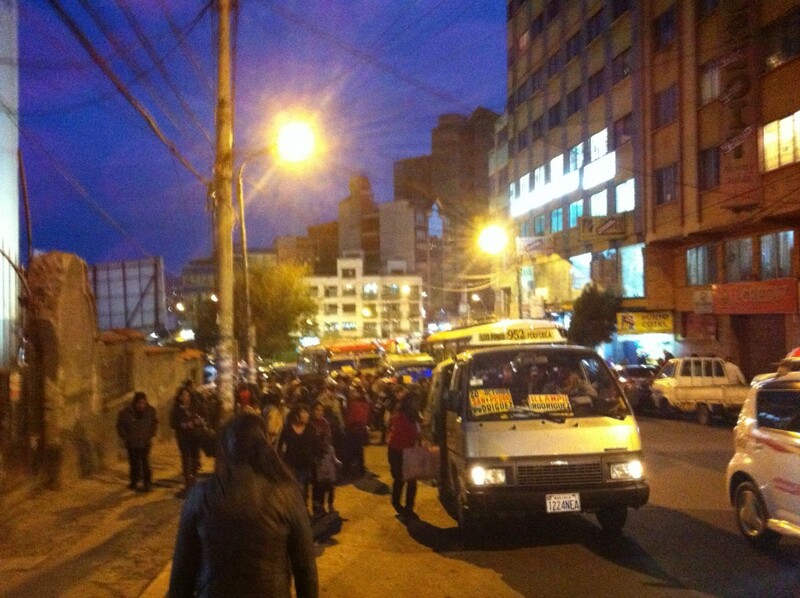 We found one that went to the Peruvian border town of Yunguyo and we packed in with loads of local women who’d been in town at the daily market. 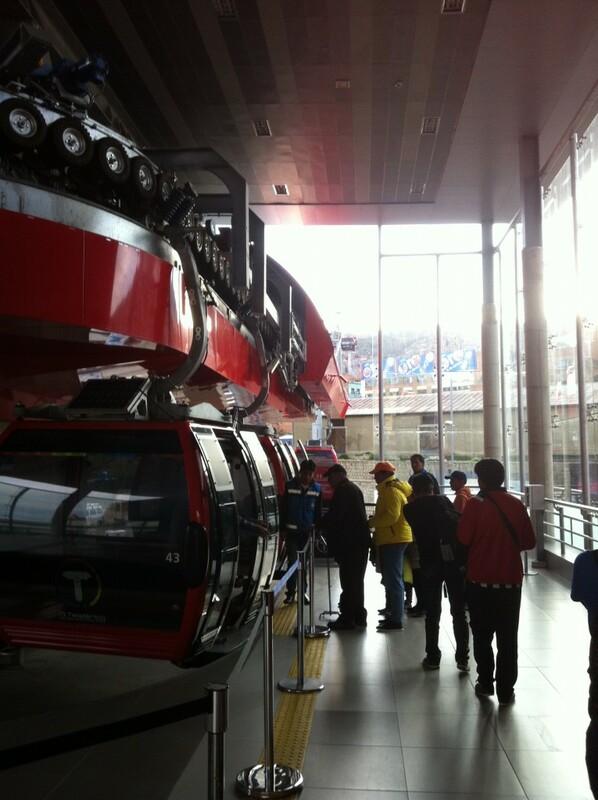 Our bags were hauled up onto the roof and netted with all the other packages people had with them. We had half the back seat with John by the window. 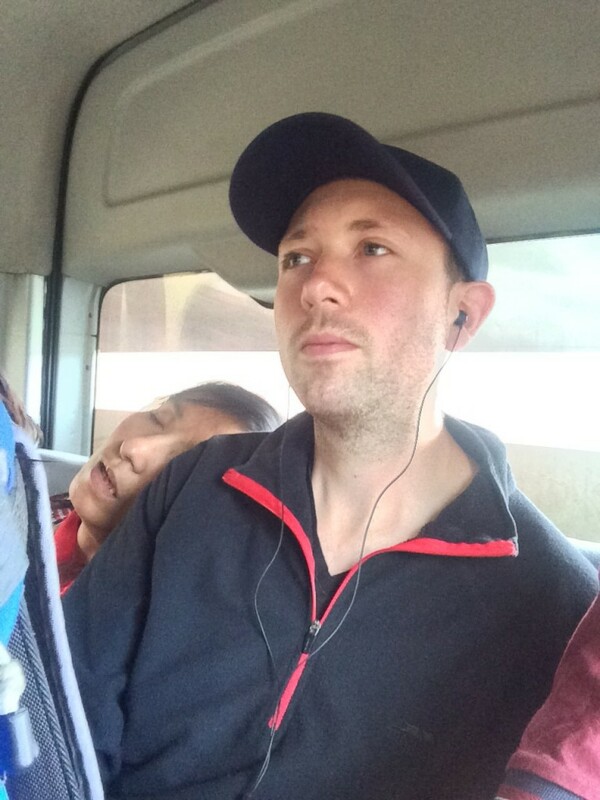 In the middle, I cozied up to the women beside me. The ‘collectivos’ (minivans) are always tight even for the locals so you can imagine how all personal space goes out the window. We just plugged in our headphones for the bumpy two hour journey. The two women beside me yapped away for the first hour and ate lots of snacks – none of which I could make out. All sugary treats but none came my way unfortunately. She also strangely produced these animal toy figures and started playing with them. Maybe she bought them in the market for her nephew and was making sure they worked. The minivan was rocking about and she fell asleep as a bit of rain came down and ended up on my shoulder for the next hour. Sure what was she to do. I just passed the time listening to George Hook travel podcasts pretending not to notice. 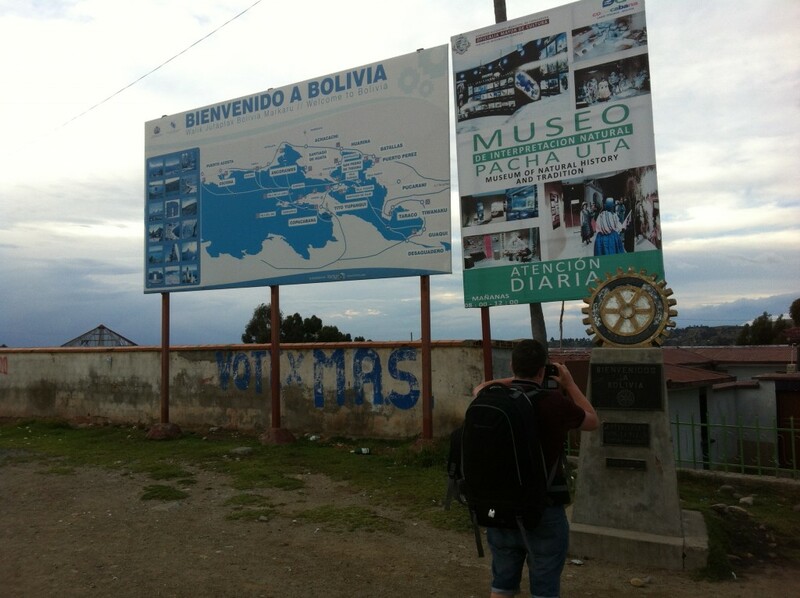 By the time we arrived in Yunguyo, we knew time was tight as the border closed at 7pm or 8pm and we were also losing an hour as Bolivia is an hour ahead of Peru. It was about 6.30pm and the border was about 4km or so from where we were. There was a guy in the town square with a bicycle rickshaw, though nothing as fancy as the ones in Dublin. This guy basically had a bench-wheelbarrow at the front. In we got after a bit of negotiation. The guy struggled to get going but on we went for a block as he alerted the one car that passed with his horn. We thought he’d bring us to the border but he just brought us 100 metres to the next square where there were some taxis waiting! We could have walked that. Let’s just say we weren’t overly impressed with his services as we got into a taxi for the final few kilometres. 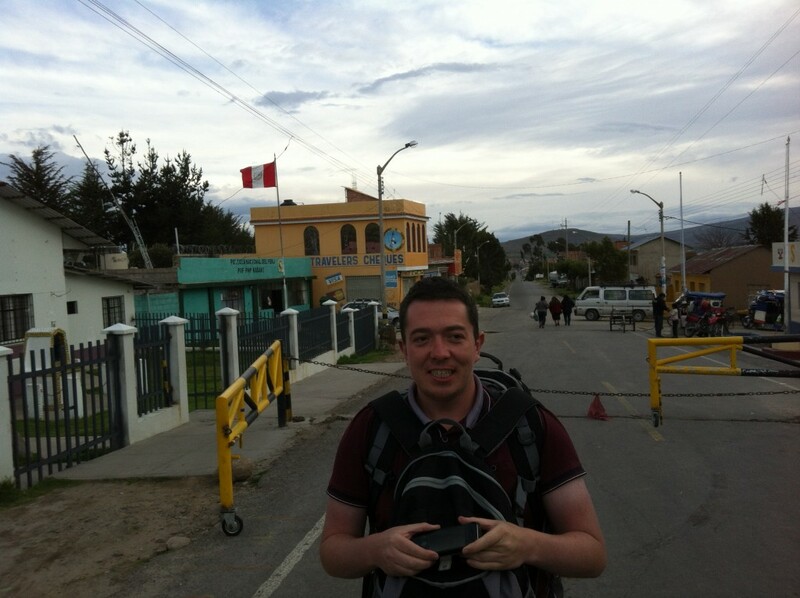 We got our passport exits stamps at the small Peruvian border office and walked the 800 metres over the border. 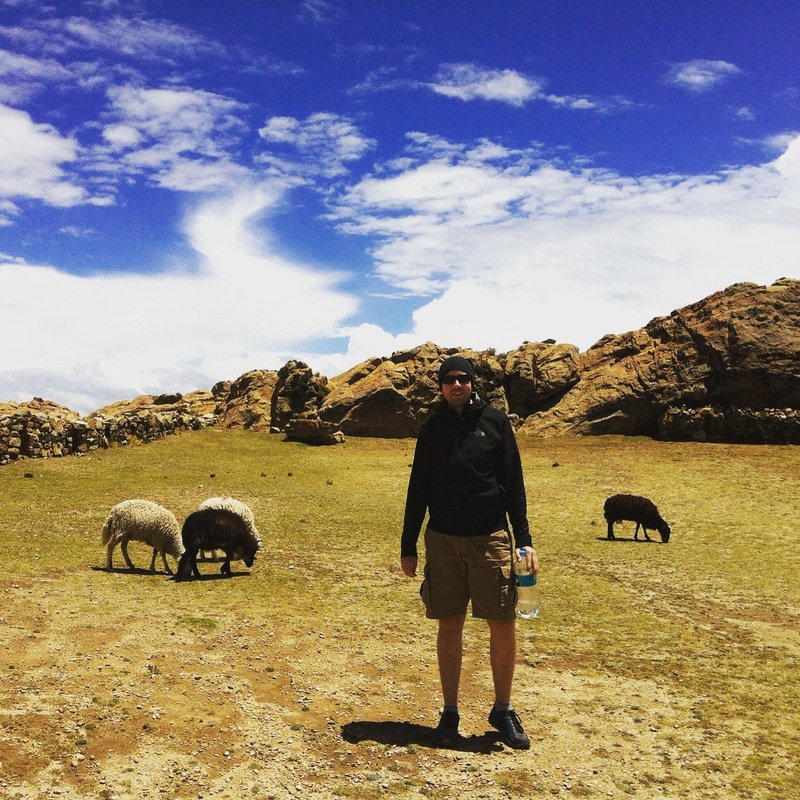 After a month in Peru we were ready for a new adventure and discovering a new country. 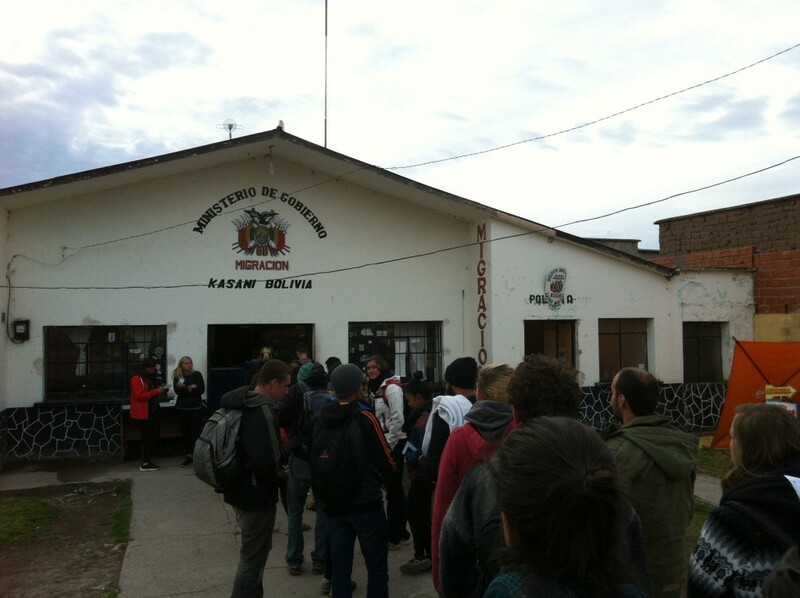 The Bolivian border office was open and we filled out an entry form and got our entry stamps. 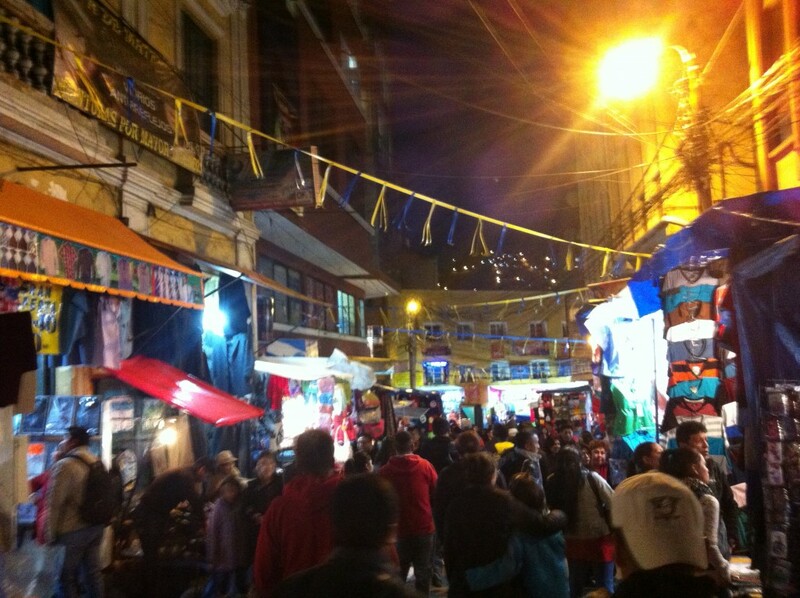 Bolivia is one of a few South American countries which charge a fee for some tourist depending where they are from. Americans always get hit, in this case with a $135 fee. Canadians are also usually in that group too. 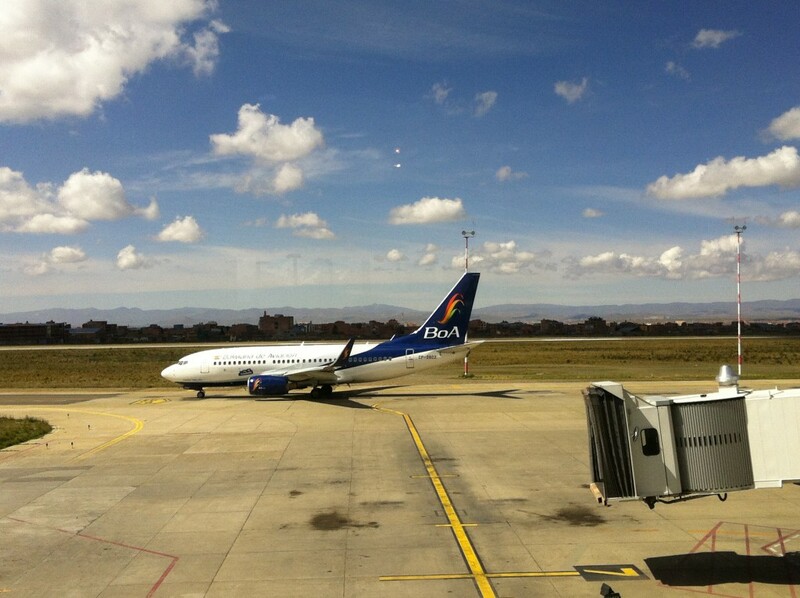 They are just getting back at their governments for imposing visa restrictions on Bolivians entering their country. Thankfully no such hassle with our Irish Passports!! 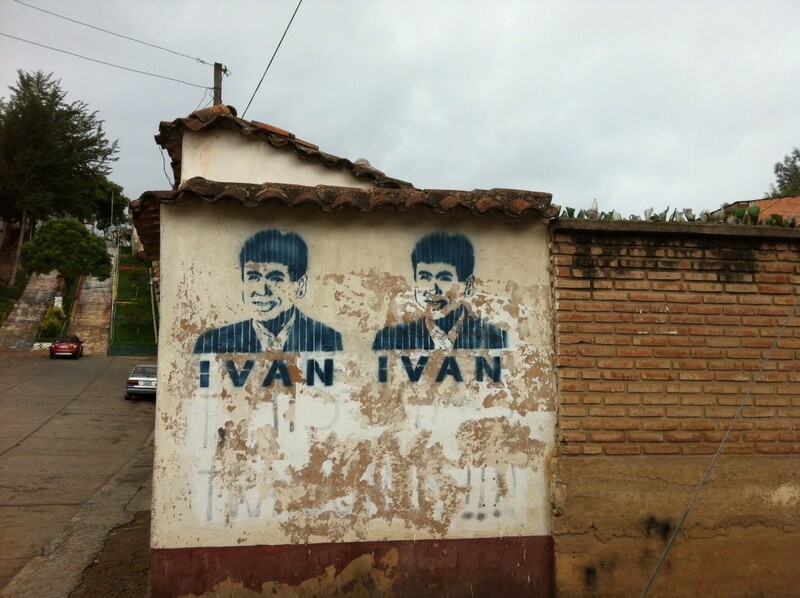 The EU must be a bit nicer to Bolivians. 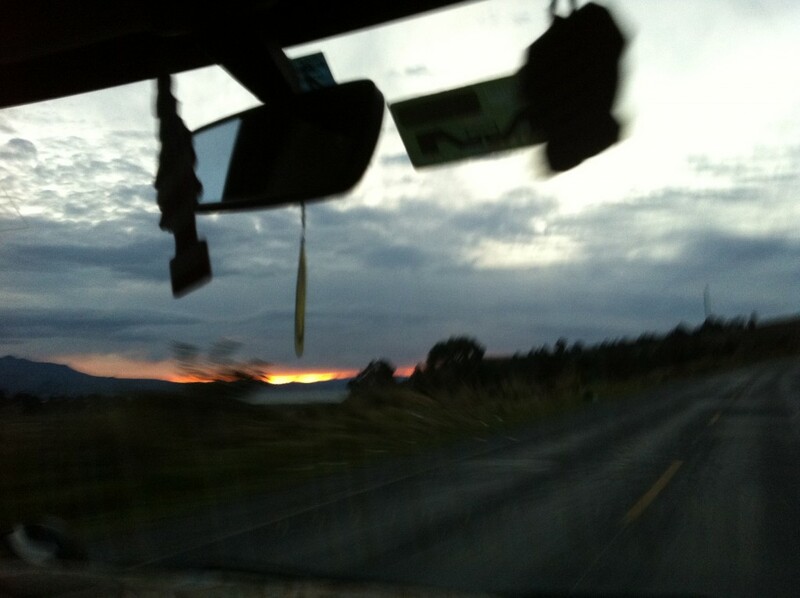 We got another minivan the 8km from the border to the town of Copacabana and saw an amazing sunset out the front window. It was a great way to round off the day’s travel adventures. We checked into Hostal Sonia which was run by the woman of the house, Sonia, a lovely out-there Bolivian woman with a few amazing golden teeth. She must be bringing the money in! What struck us first about Bolivia was that the people were more indigenous looking than even the Peruvians. 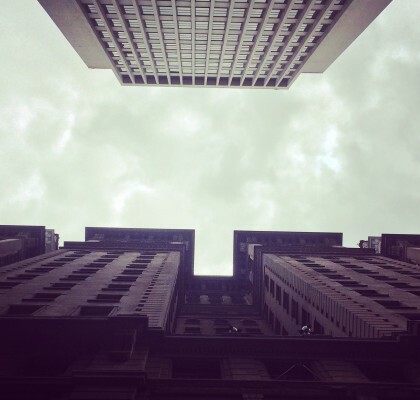 Darker and shorter – we were like pale giants. 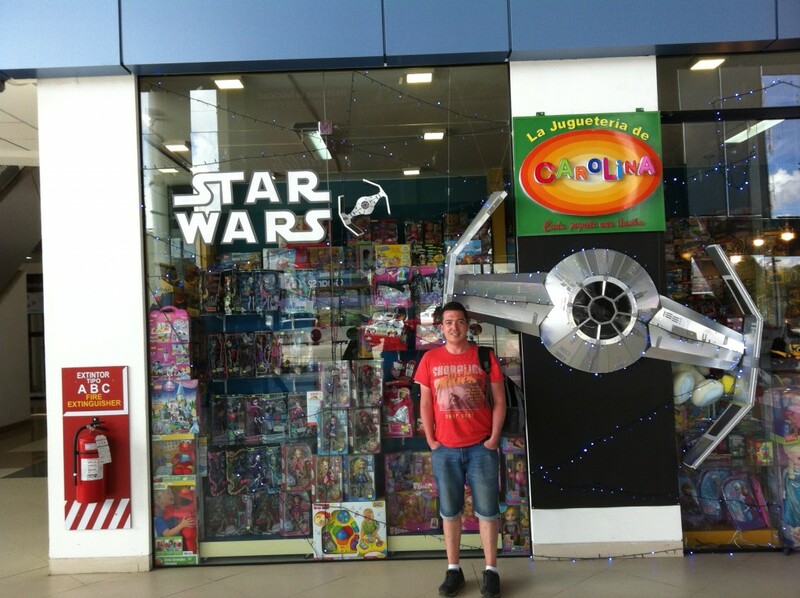 It was also another bit cheaper than Peru. Hostels were about the same, but everyday food and eating out became less. Bus trips also dropped in price with the age of the buses increasing by the same amount. Their president, Evo Morales, has been in power since 2005 and is one of the last left wing governments in South America. The left tide that swept the continent has reversed and elected more right wing governments in most countries over the last few years. 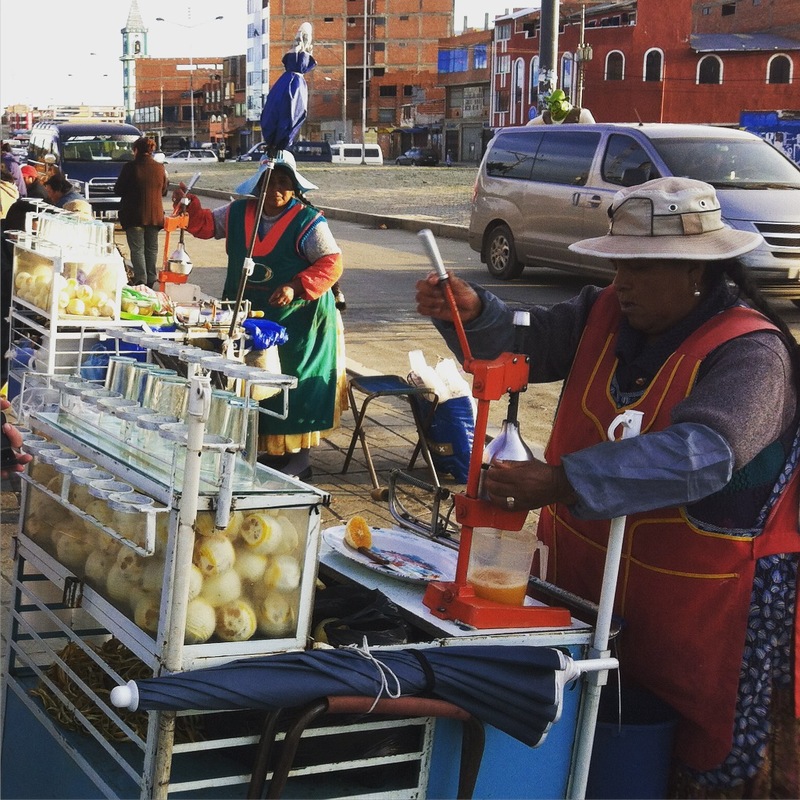 He’s also the first indigenous Bolivian to be elected president and is still hugely popular among the majority indigenous population. Only two months ago he tried to change the constitution so he could run again for the Presidency, but the people voted against it. 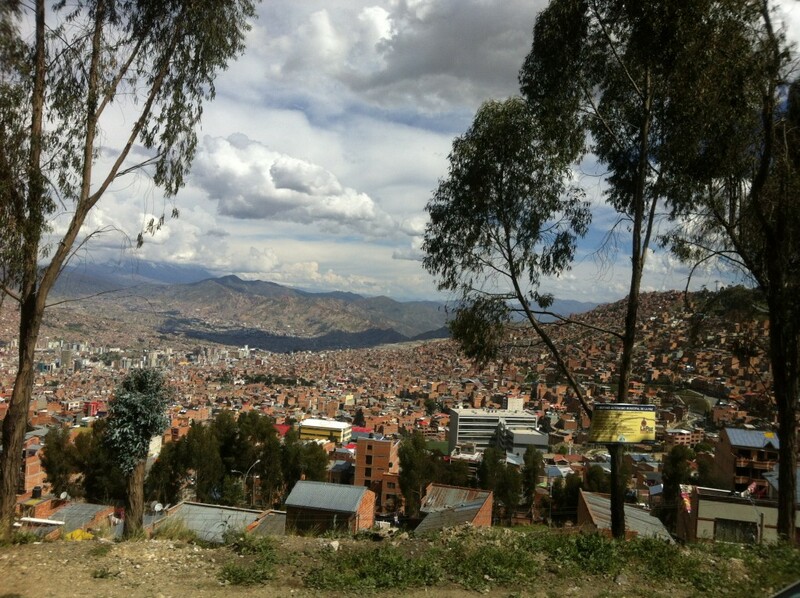 You get the idea of how Bolivia is run! Anyway, back to our travels. 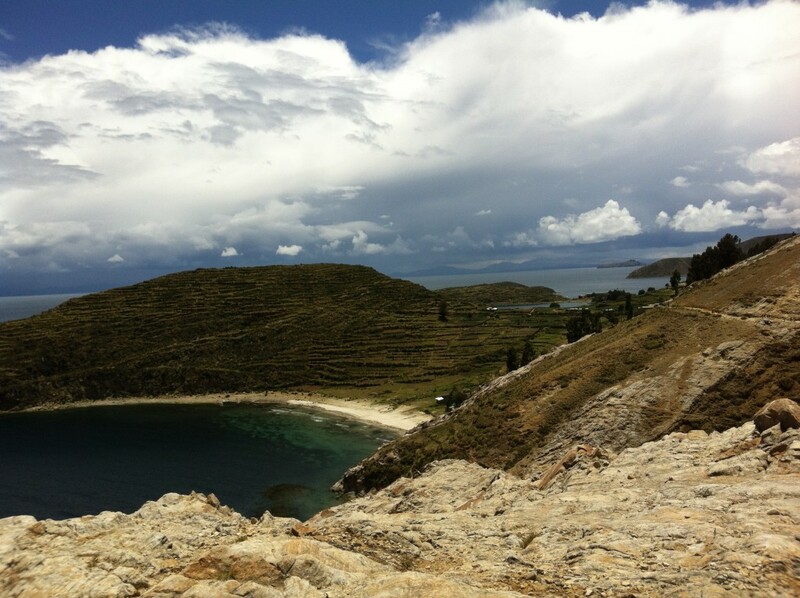 Lake Titicaca is the highest navigational lake in the world at an altitude of 3,800 metres. We were back in the land of short breaths and constant sun cream territory as we were closer to the sun. 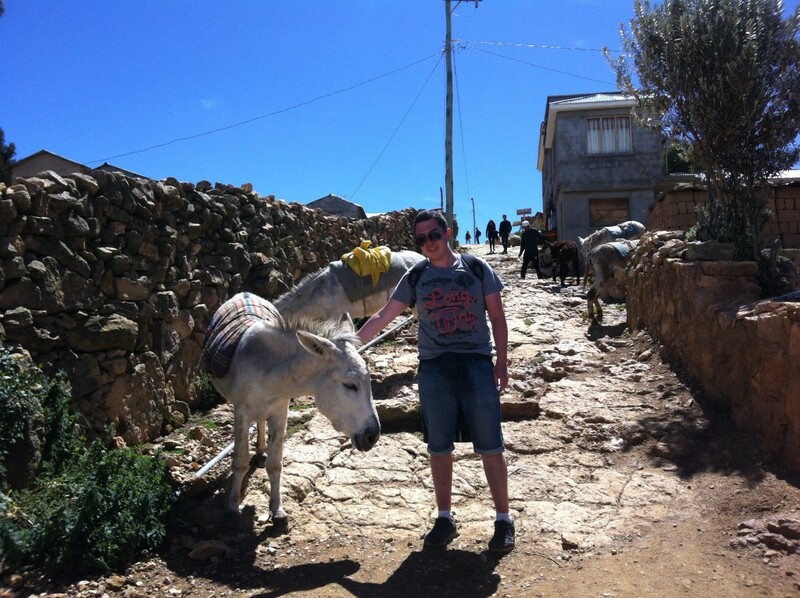 We were both fine after lots of acclimatisation in Ecuador and Peru. 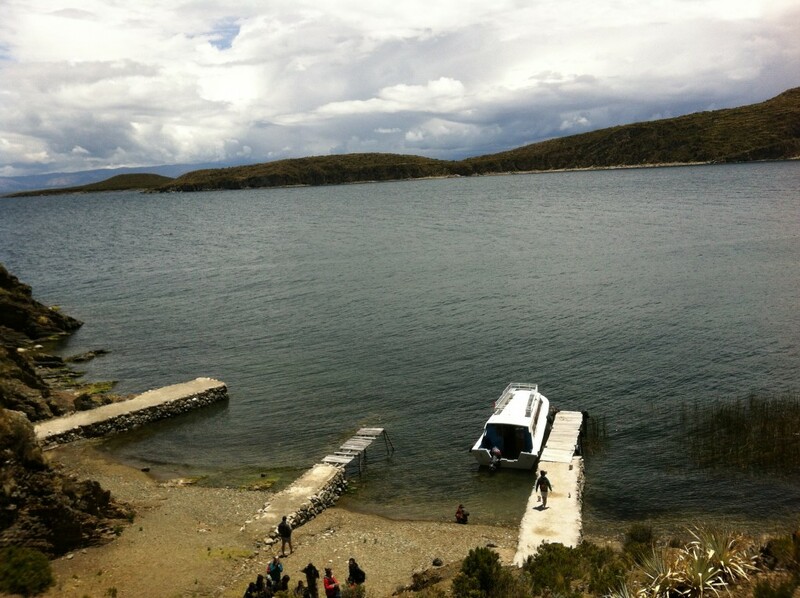 We took a small boat ride to the largest island on Lake Titicaca called Isla del Sol (Island of the Sun). We sat on a bench on the roof of the boat on our way to the island with the other backpackers, Brazilian guys and Germans gals. 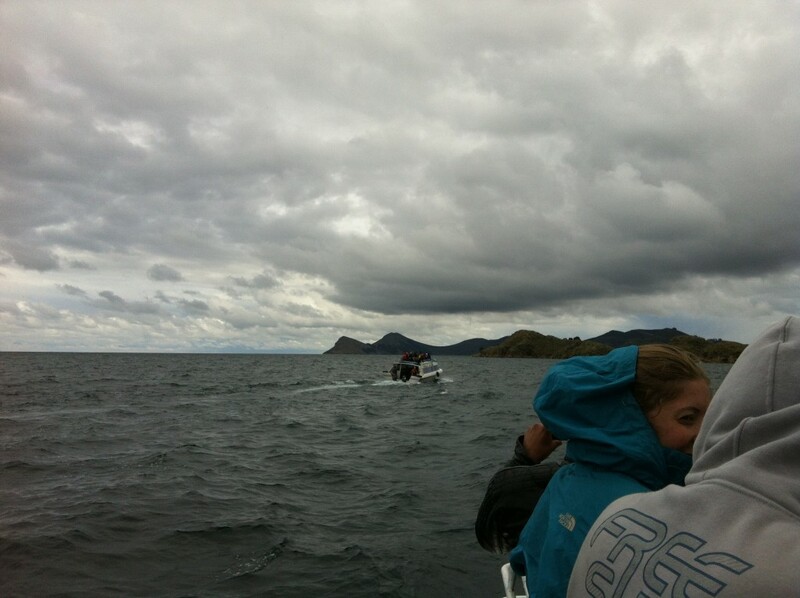 It took about two hours to reach our destination and it dropped us off at the northern tip. 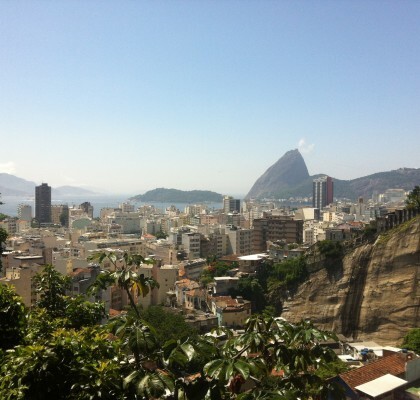 We spent the next 3 hours walking to the southern part to get our lift back to Copacabana. It was a beautiful trek through rolling hills and small local farms. Lots of sheep, cows, pigs, and locals. Almost like the west of Ireland. And then we meet these gorgeous beaches where some backpackers were staying in tiny guest houses. 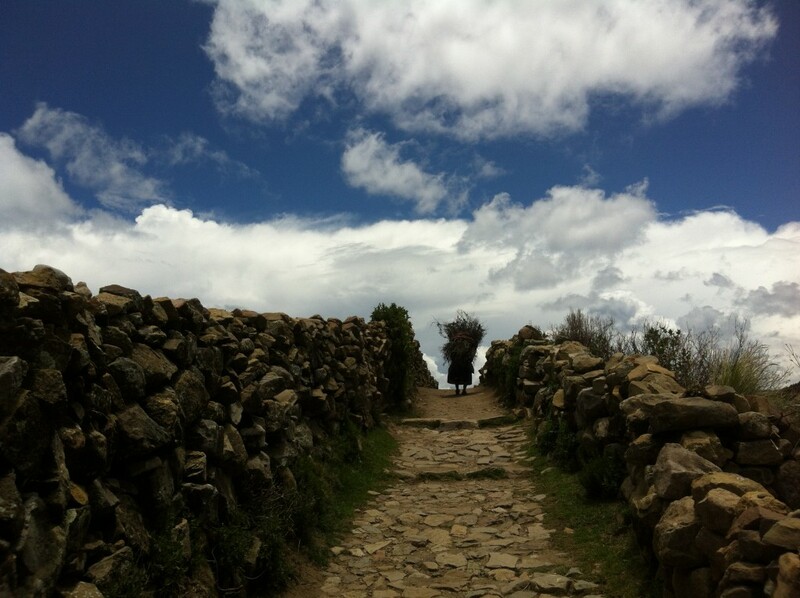 There were also quite a few sites from the Inca period on the walk. We found the walk really tough going due to the altitude and the sun that was bating down all day. We both got sunburnt, surprise surprise!! We were knackered on the boat back along with the rest of the group. Three hours later we woke up and had arrived back in port. 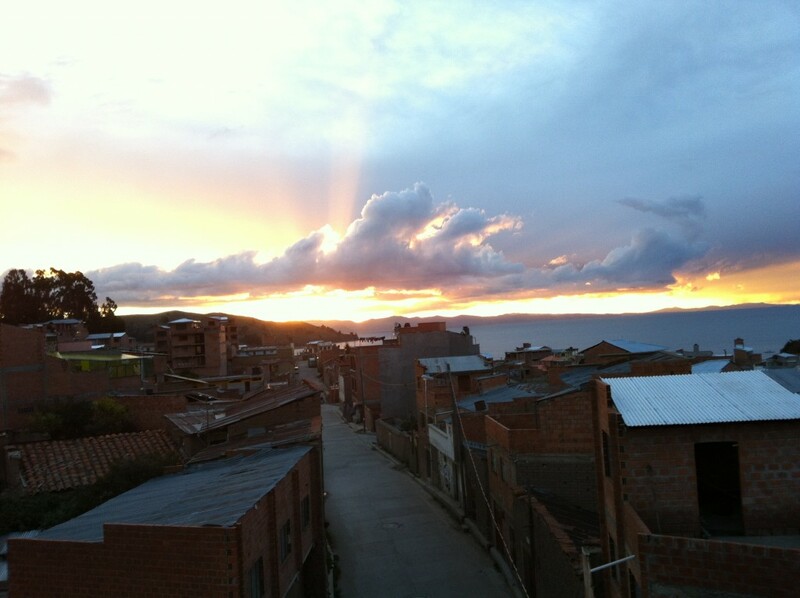 After two nights in Copacabana it was time to make the 2-3 hour journey to the working capital of Bolivia, La Paz. We hopped on a bus at 11am and after an hour, we had to disembark and get on a small boat to pass a narrow water crossing. Which was actually quite fun! 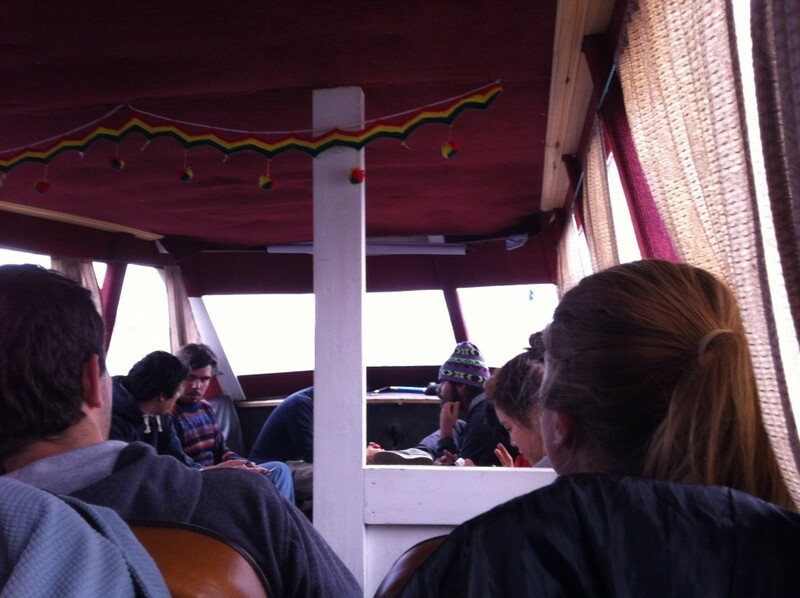 The bus followed on a barge and on we went for the final 2 hours. 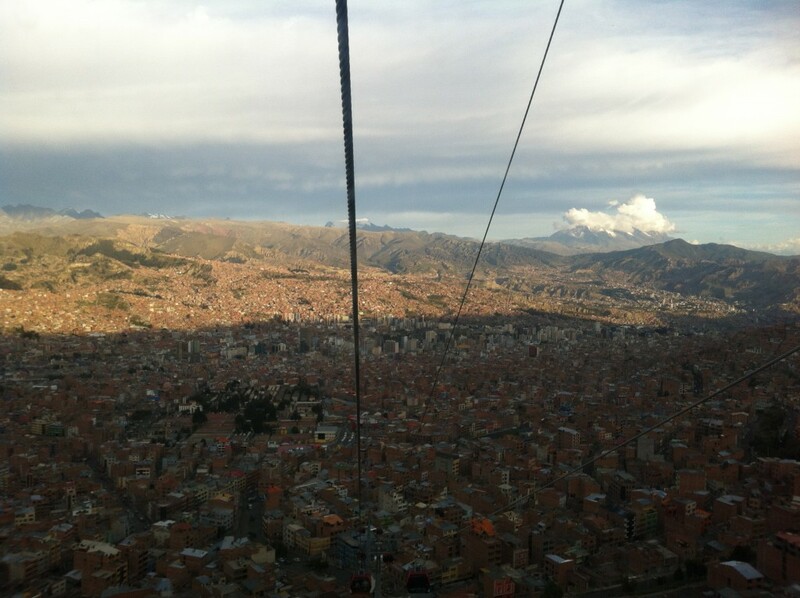 La Paz is a huge city positioned in a valley with terracotta brick houses occupying every space possible. There are also big towns running over the top of the cliff and into the distance. Where the bus dropped us off was about a 20-30 min walk to the very centre where our hostel was. One of John’s bag straps broke so we had to try and do some improvisation beside the city’s main cemetery. (We found a small stall the next day with a man and a sewing machine which fixed it in an hour!). 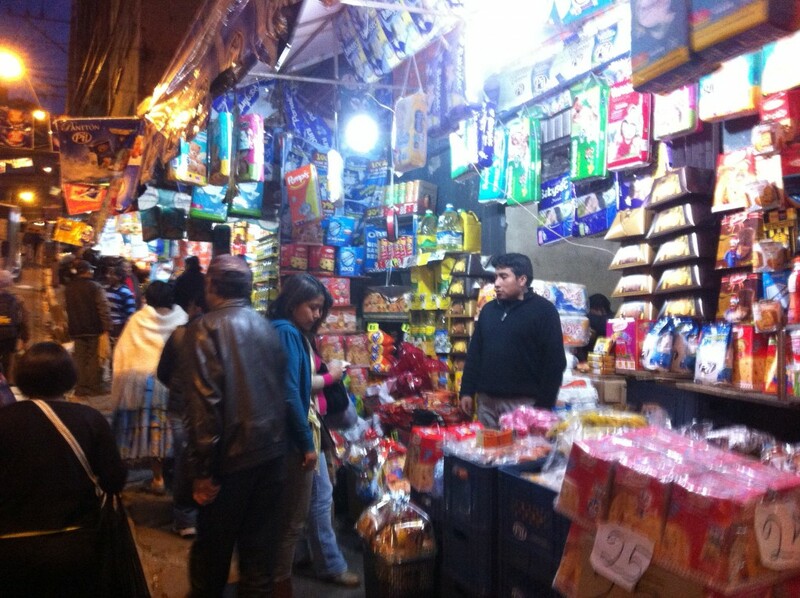 We walked down the steep hills to our hostel passing street market after street market, selling anything you could wish for. All fake of course. 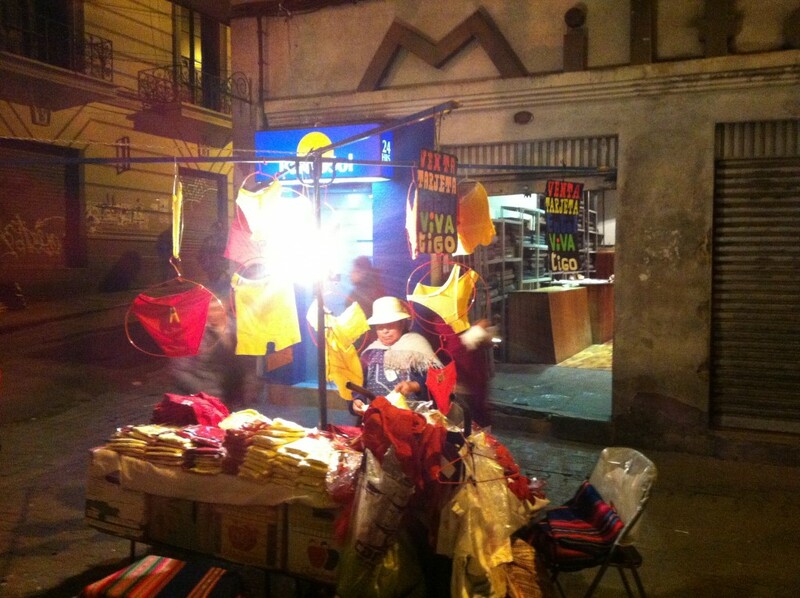 Yellow and red underwear must be the rage as the same uniform style was being sold all over Bolivia! We passed the Witches Black Market where you can buy potions and all sorts. We found our hostel (York B&B) without needing anything. It was very central which is what we usually go for. We had booked a private room with no windows. Looked fine on booking.com, not so great when we arrived. 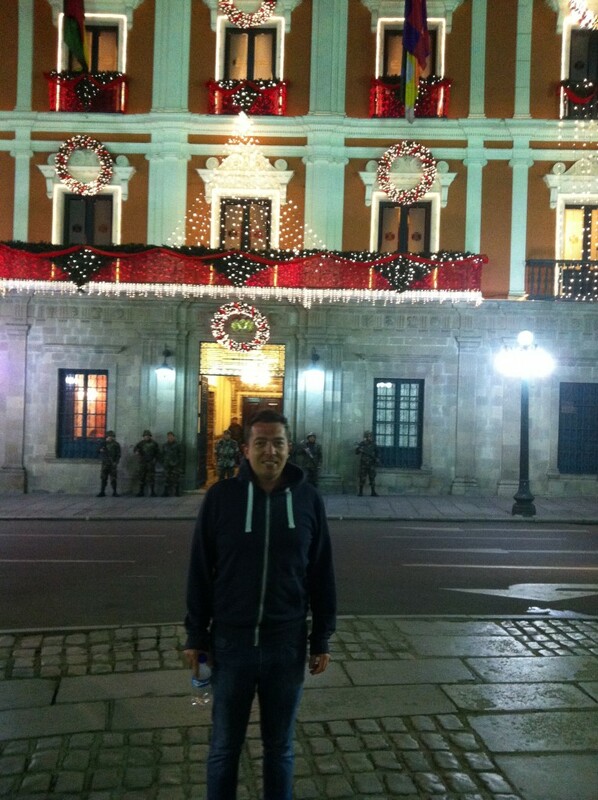 We had four nights ahead of us so we just settled in and wandered around the city centre that evening. 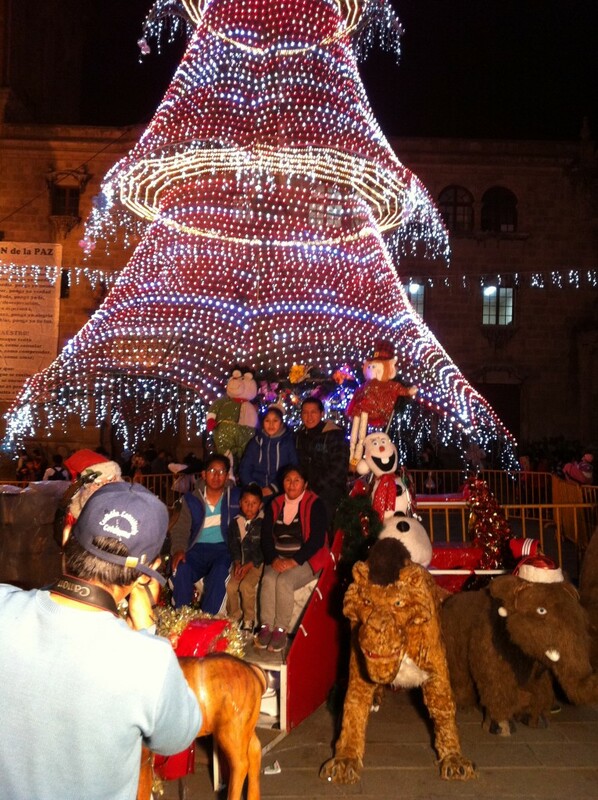 Lots of Christmas decorations were still up with families milling around outside the San Francisco Church and getting portraits taken beside Christmas themed backdrops and cartoon characters. We resisted and just sat on the steps and munched down popcorn watching the world go by. (They sell freshly made popcorn on every street). Some slices of pizza later and we were done for the night. 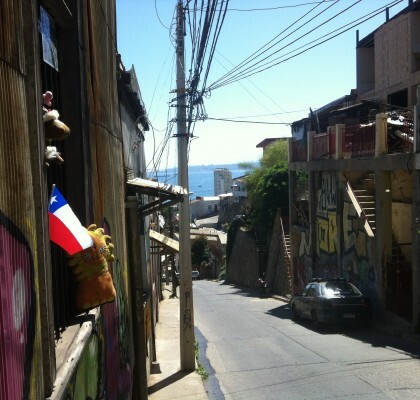 We woke up the next morning with John developing a bad cough which was probably a reaction from the sunburn in Isla del Sol. And my stomach wasn’t too great after the pizza or maybe tainted water from somewhere the day before. We just stayed in pretty much all day. Cough medicine and some fizzy Sprite helped and we got out for dinner and saw a bit more of the city. The next day (Wed 30th Dec) was Day 3 and we headed to the central bus station to buy tickets for two days later (Fri 1st Jan). 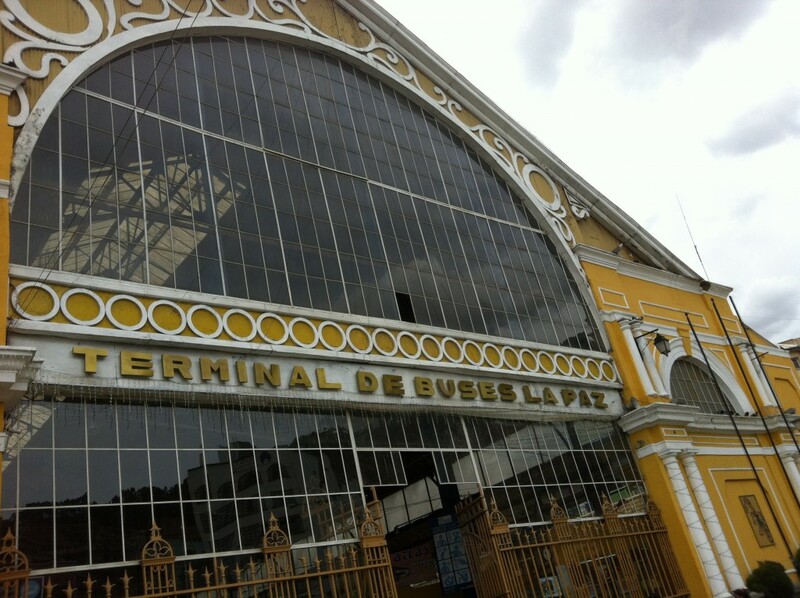 The bus station was designed by Mr. Eiffel himself but the iron and glass structure needed a lot more TLC. Every bus company desk we approached say No… nothing at all until well into the weekend. 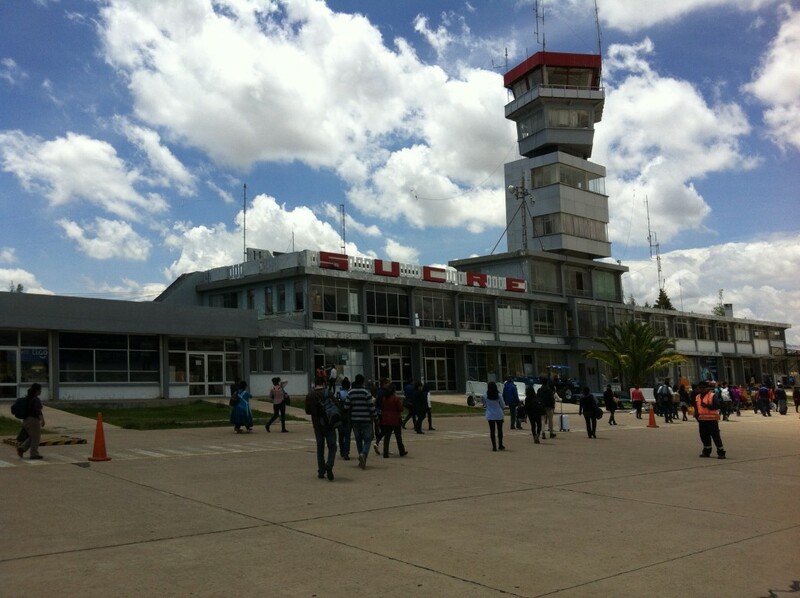 That was four days away and we needed to make it to Sucre in the south of the country (about a 12 hr bus journey). 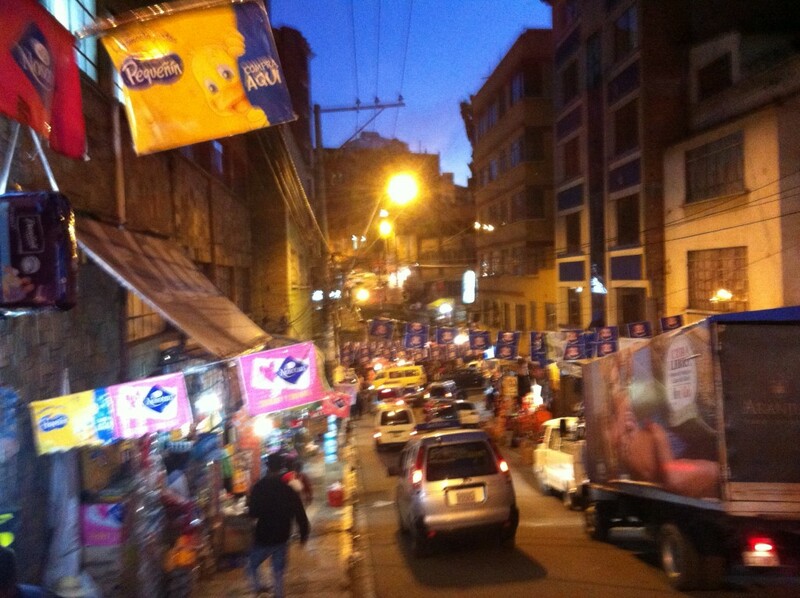 La Paz is fine as cities go but we were ready to move on from our hostel. We quickly found some wifi and looked up flight options. Not surprisingly there was a flight available the next day but it was pricey. We went for it – no other option. 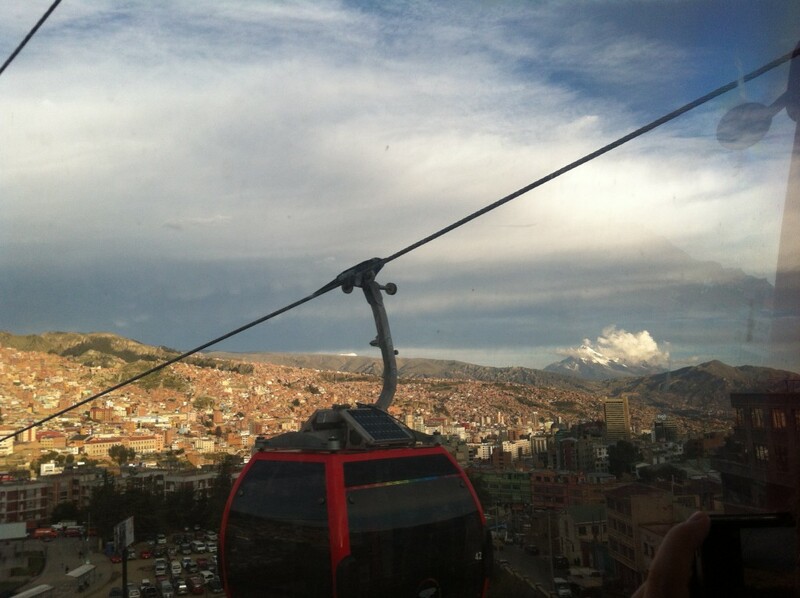 We spent the rest of the day travelling on their cable cars up the side of the valley and to the north district to get good views of the city. That night we drank a few pints in The Wild Rover hostel (Irish themed) not far from our own as we heard it was good craic. It was such a change from where we were staying. An Irish bar full of Aussies and other nationalities but hard to find an Irishman in the place. 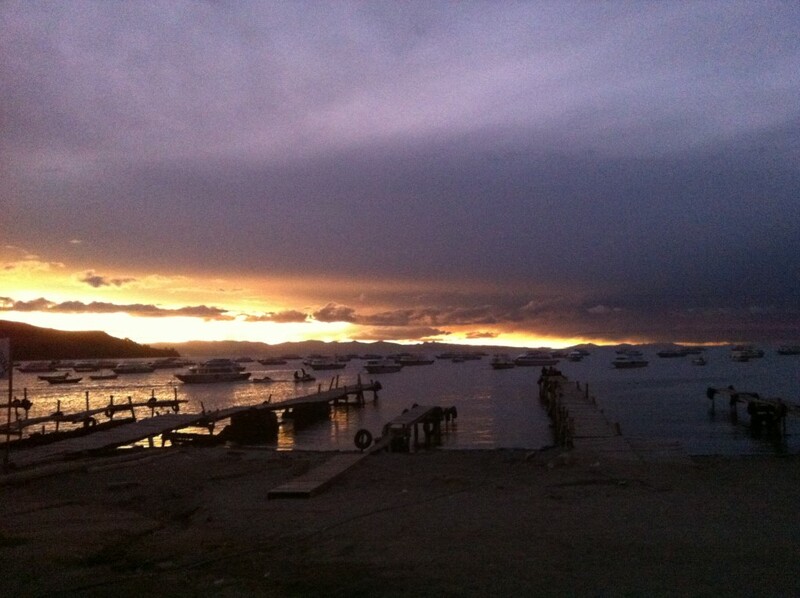 It was a world away from the city outside and it was what we needed to round off our La Paz experience. 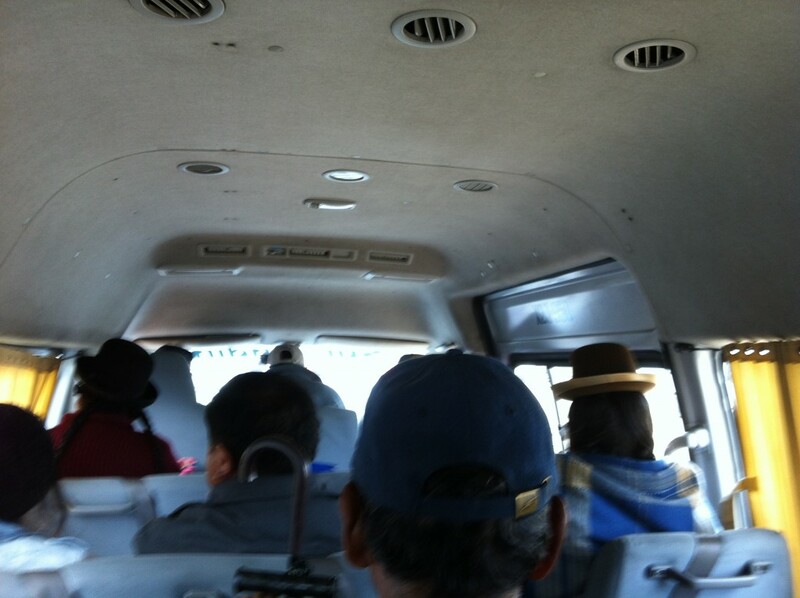 The next day we got we got an early minivan ride and airport coffee before we boarded our 90 minute flight to Sucre. 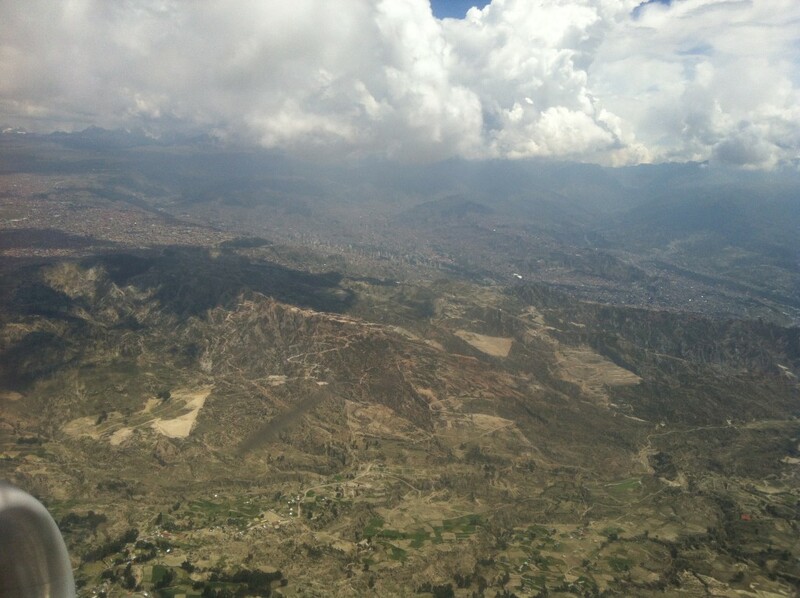 The landscape outside was of mountains and deep valleys cutting through the centre of Bolivia. Nothing else. 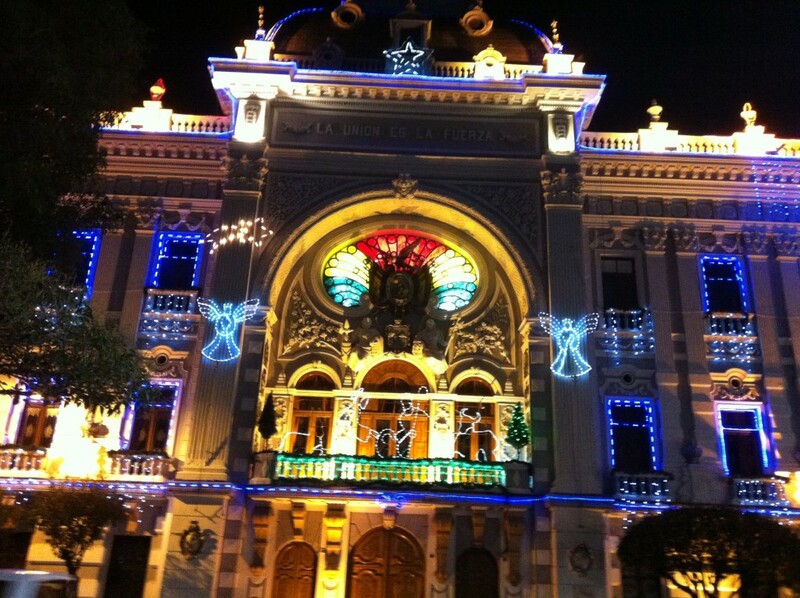 Sucre is the traditional and constitutionally recognised capital of Bolivia, but La Paz is the seat of government and working capital – there’s one for the next table quiz! It prospered as a city over the centuries due to the nearby silver mines which are still in operation. 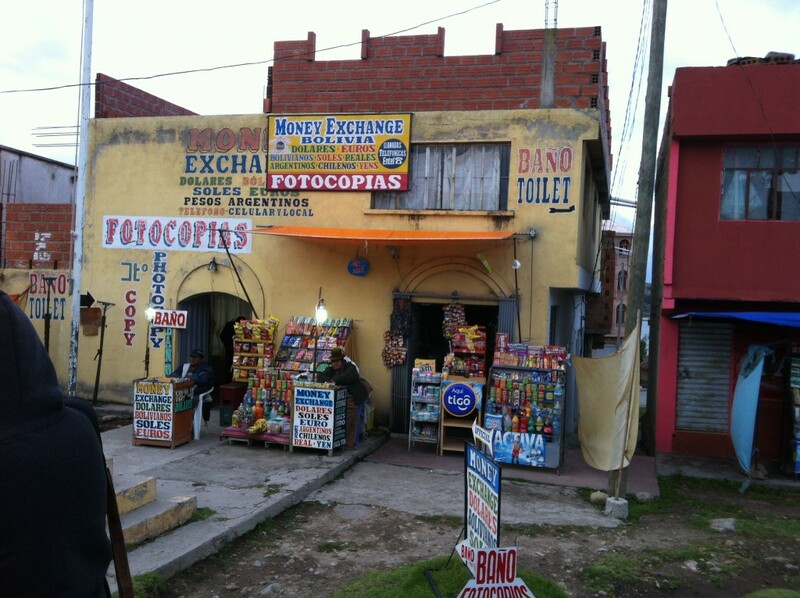 You can still visit them in the city of Potosi, though the lonely planet guidebook basically says see them at your peril! 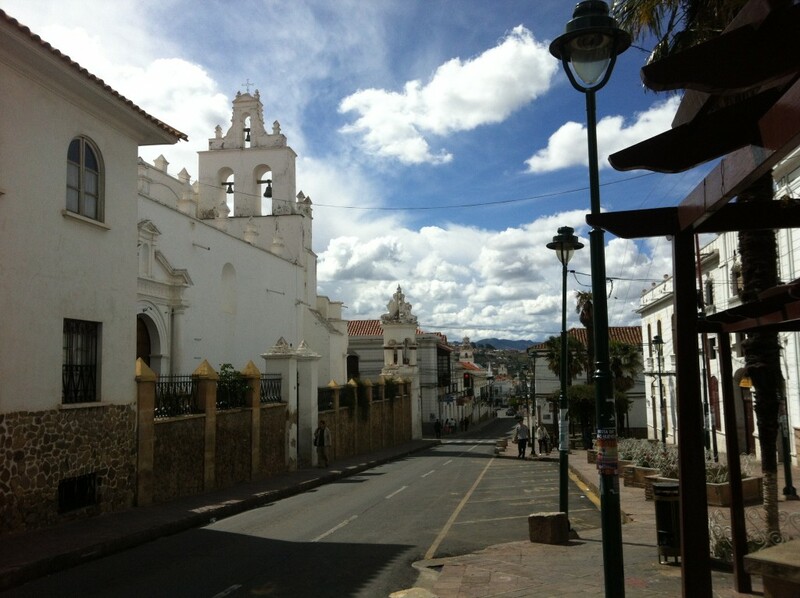 Sucre is also known as the ‘white city’ as all the colonial style buildings are whitewashed and it’s also famous for important dinosaur discoveries. One even met us as we walked out of the airport gates. 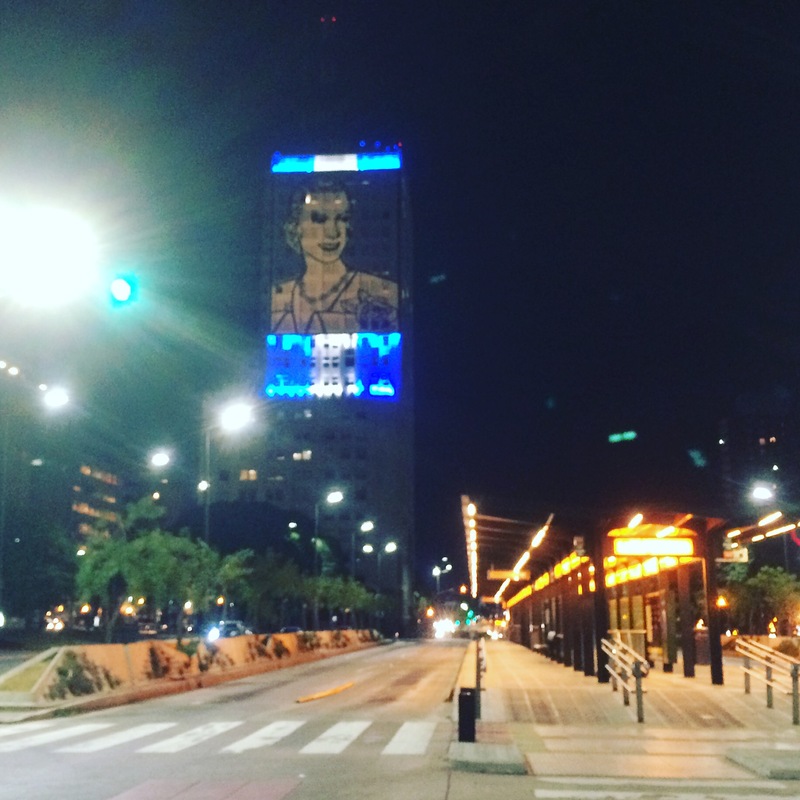 They are everywhere around the city. We stayed in a really nice house just off the main square. It had two courtyards with rooms overlooking them. The owners extended family lived in the next courtyard and their little dog was very friendly but known to bite. The booking.com hotel reviews were hilarious… all people wrote about was the dog and how it had bitten them. We kept our guard and were fine. 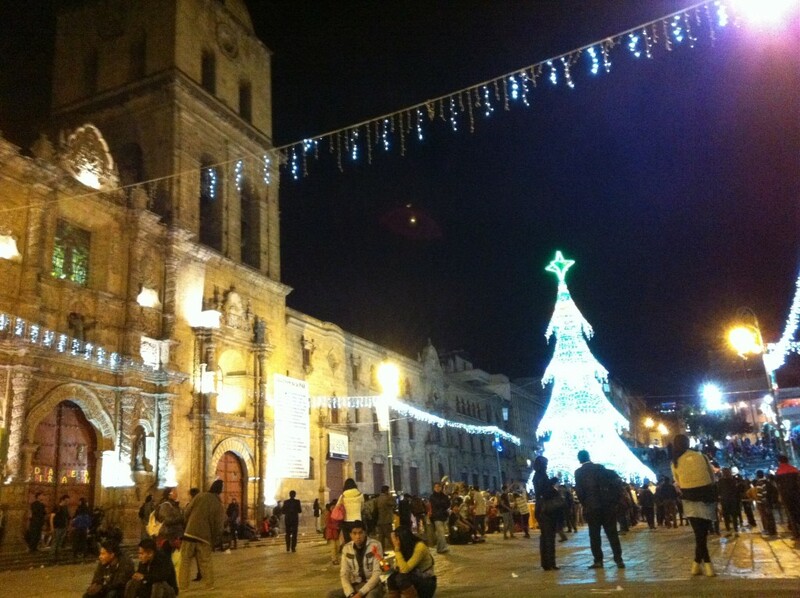 It was New Year’s Eve and there were lots of celebrations in the main square, fireworks and all. We took it pretty easy and I got stuck into ‘Making A Murderer’ on Netflix which had me watching non-stop for a few days. 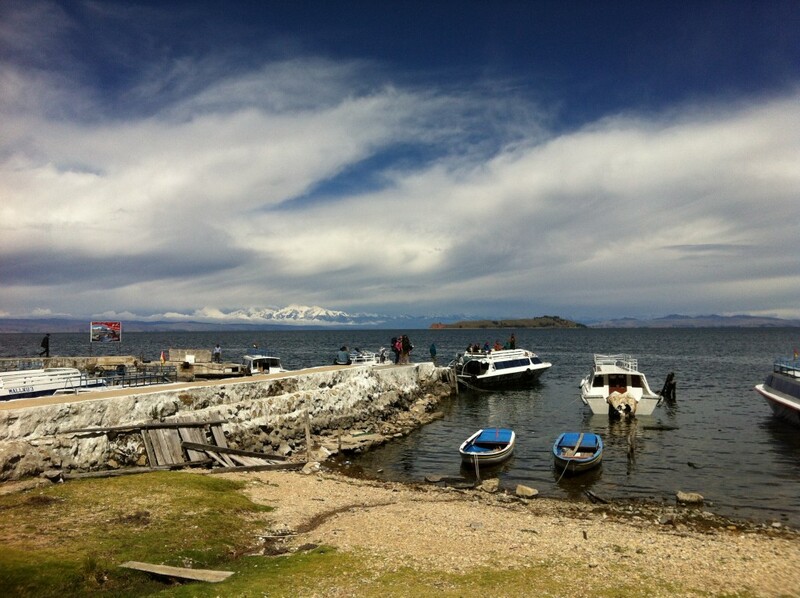 Sucre was three days of chilling and recovering before we headed to the Salt Flats and on to Argentina. 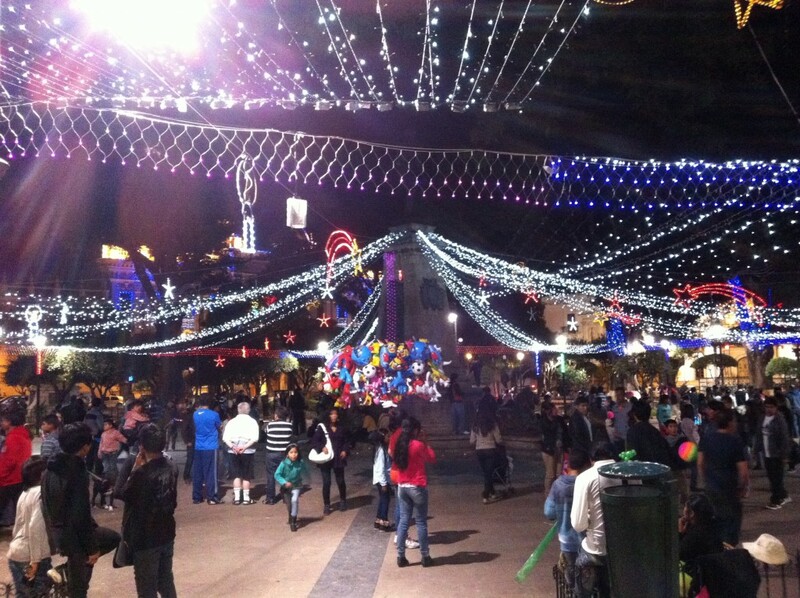 We did a lot of wandering around the markets, eating, drinking and checking out the main park and official buildings. Sounds exciting?! Well not everyday away is full on exciting – we have lots of downtime too just to catch up on things. 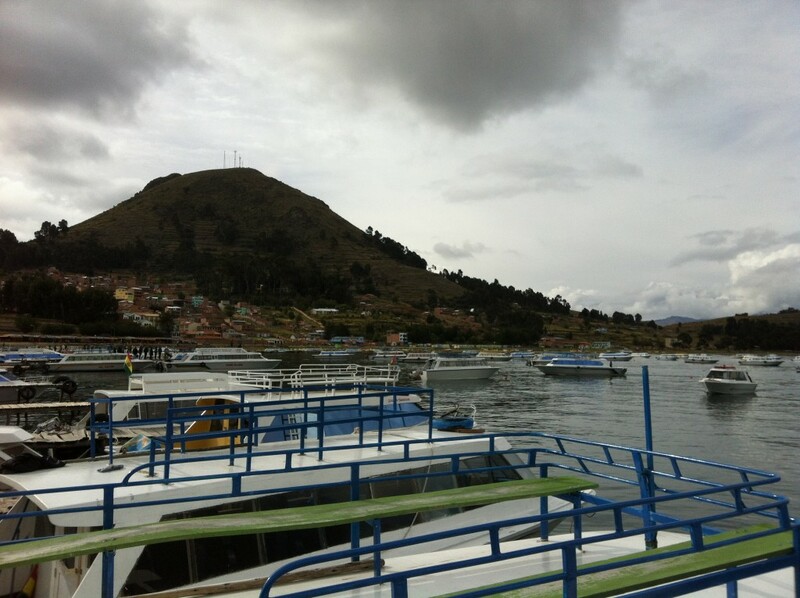 Sucre was a perfect place to recharge the batteries before we moved on. 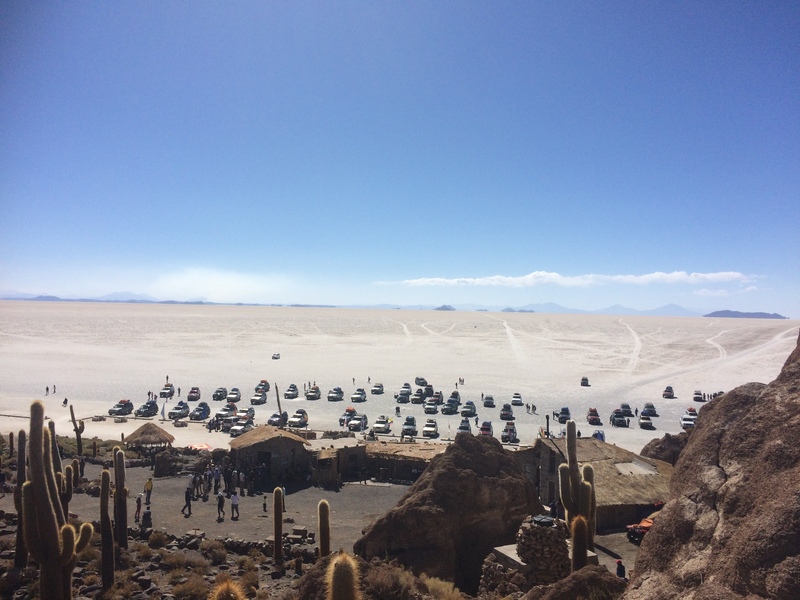 John has already posted about our time at the Bolivian Salt Flats – check it out Here. He’s also got Argentina done which will be going up over the next few days.